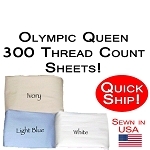 Olympic Queen Size Bed Dimensions are 66 inches wide x 80 inches long. These are standard Olympic Queen bed measurements. 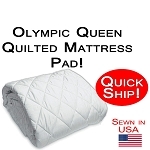 Olympic Queen Mattress depths can vary from just a few inches to 16" or more for the new huge pillow tops. 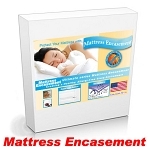 Many times, actual Olympic Queen mattress dimensions will vary by one or two inches, usually smaller. What is an Olympic Queen Size Mattress? Question: What is an Olympic Queen Size bed set anyway? ANSWER: The Olympic Queen size was dreamed up by Simmons Corporation, one of the major 3 bedding corporations in the world. 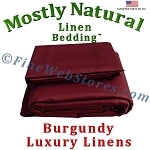 It is also called an Expanded Queen size or a Queen extra wide. The Olympic Queen size mattress is the same length as a traditional Queen mattress but it is 6 inches wider than a traditional Queen. 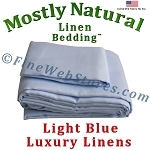 A traditional Queen size mattress is 60" wide by 80" long. An Olympic Queen is 66" x 80", a full 10% wider. 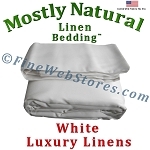 Many people would prefer to have a King size mattress but lack the bedroom space. The Olympic Queen size gives that bit of extra room. Bigger than a Queen, smaller than a King. Now that you know the difference between a conventional Queen mattress and an Olympic Queen mattress I need to further complicate things. The Simmons company sold the Olympic Queen mattress with a type of flat padded platform that actually sat on top of a conventional queen box spring. The mattress winds up being 3" over-lapped on each side of the box spring, but not head to foot as both sizes are the same length. The platform added support to the three inch overhang on either side of the mattress length. They used a conventional queen box spring because headboards and metal bed frames to accommodate the new Olympic Queen size would be impossible to come. 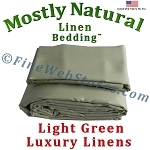 Plus, the consumer could use their present queen bedroom furniture so the Olympic Queen size would sell better.